The 2019 Toyota Sequoia is the perfect family vehicle for drivers looking for a blend of space and performance. With a max towing capacity of up to 7,400-pounds when properly equipped and light off roading capability, the 2019 Sequoia is the perfect tool for family road trips, traveling to the lake, or daily hauling responsibilities with a large family. The Toyota Sequoia is available in eight exterior color options and four configurations (SR5, TRD Sport, Limited, and Platinum) for the 2019 model year. Base models have a starting MSRP of $48,700. Learn more about the lineup’s features and performance below, or head to the Serra Toyota inventory pages via the link below to see which models are currently available in Birmingham. Depending on the trim level and configuration, the 2019 Toyota Sequoia can seat up to eight passengers (seven when equipped with second-row captain’s chairs). When all seats are upright, the cargo space offers 18.9 cubic feet of storage or 120.1 cubic feet when the rear seats are folded flat. Passengers should have plenty of elbow room in all rows and the generous cargo space means all of the gear can fit in back. The 2019 Sequoia lineup comes standard with a 5.7-liter V8 engine rated at 381 horsepower for responsive handling, even at highway speeds and plenty of power for towing the family boat. Tow/Haul Mode is available, and the lineup offers a max towing capacity of up to 7,400-pounds when properly equipped. In terms of standard safety, all of the bases are covered. Not only does the 2019 Sequoia come equipped with standard offerings like a suite of airbags and a Star Safety System, but all trims are equipped with the Toyota Safety Sense active safety bundle. Toyota Safety Sense includes Pre-Collision with Pedestrian Detection, Lane Departure Alert with Sway Warning System, Automatic High Beams, and Dynamic Radar Cruise Control. 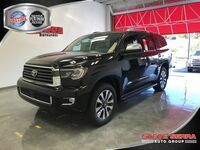 Select 2019 Toyota Sequoia models are now available at Serra Toyota in Birmingham. Stop by the dealership or use our online inventory pages to see which models are currently at our lot. If you don’t see the configuration you are interested in let us know and we will help find it for you.